Similar to the Mediterranean, Asian cuisine is widely known to promote vibrant health and longevity. There are many similarities between these diets; both emphasize eating a healthy amount of fruit and vegetables, and including beans, nuts and seafood. In many Asian countries, adults drink alcohol in moderation with their meals. They are known for spending plenty of time with family and friends and maintaining a low stress lifestyle. In honor of these common elements, we would like to introduce you to our first MediterrAsian recipe at Mediterranean Living, MediterrAsian Rice with Roasted Shrimp & Tomatoes. This recipe is a fusion of Mediterranean and Vietnamese flavors. We used Ina Garten’s Roasted Shrimp recipe at ButterYum for oven roasting the shrimp. A MediterrAsian Diet is based on eating Mediterranean and Asian food. There are plenty of fusion recipes that you can try. We think you’ll enjoy visiting MediterrAsian.com, a website with great information and a whole host of wonderful recipes. Also, Mediterranean Living will be holding a MediterrAsian Cooking Class at The Genesis Center in Westfield, MA on January 28th, 2015. Here is a link to the registration information if you are interested in attending. Heat wok or large frying pan for 30 seconds, add olive oil and heat on medium for an additional minute. Add garlic to pan and cook for about two minutes while stirring, until lightly brown. Bring heat to medium high. Add basmati rice and stir to coat rice with olive oil and garlic. Cook for 3-4 minutes, stirring occasionally. Add tomatoes, fish sauce, salt and pepper and cook for an additional 2 minutes. Equally portion the rice and tomatoes into four large, shallow bowls. 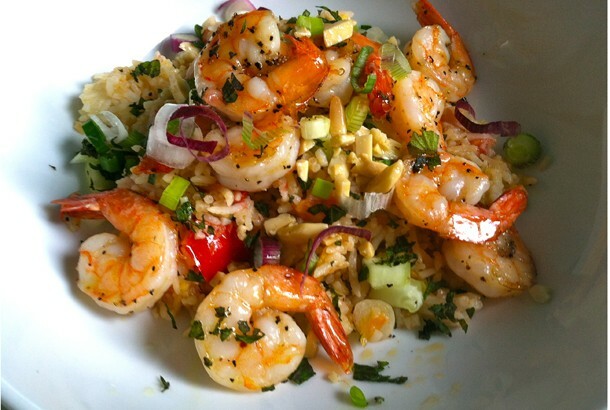 Add shrimp to each bowl and garnish with cucumber, almonds and herbs. Looks amazing! Thanks for linking to my blog!